My brother, when he was in high school, had a shirt that said "It's All Good." It was written in some computerized script that made it appear to say "It's All 6000." The phrase slipped into our lexicon, and my mom grew to hate it. Where was I going with this? Oh yeah, Jimmy's Diner. I mention the phrase again because the sign outside Jimmy's Diner includes the line "It's All Good Too." That's a whole heck of a lot of bragging, right? always been on Edison Avenue on the southeast side of Benton, but it hasn't. It sits a few blocks from the recently closed classic Burger Barn, in a building that has been there a very long time. I think it had an insurance office in it a decade ago. Even when you walk inside Jimmy's, you'd swear it'd been there nigh on forever. The memorabilia on the walls is aged. The photographs are ancient. The place even smells like a diner that's been around a couple of decades. But Jimmy's is only five or six years old. I dropped in one Tuesday morning for a bite to eat while I was kicking around the area. I sucked down a cup of hot coffee while trying to come to terms with the breakfast menu, which featured a whole lot of sausage and bacon. As in, every dish came with a choice. There was also a listing for a slice of country ham, which if as epic as I think it is, would be one of those inch thick plate sized slabs... but of course, I wasn't going for that sort of thing. 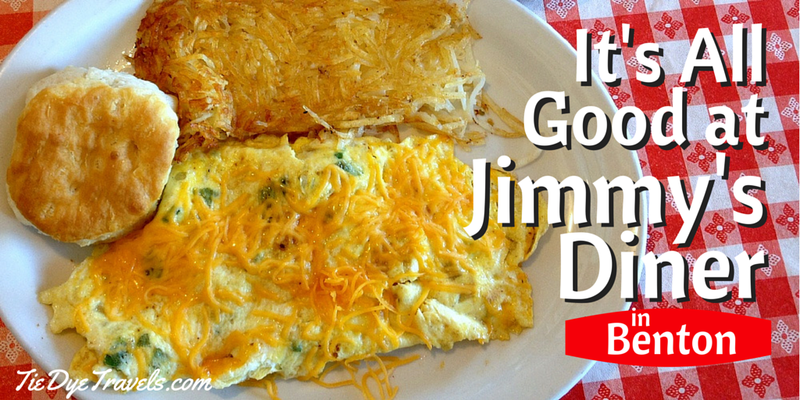 I did see mention of chocolate gravy and had considered that over biscuits, but then I saw Jimmy's offers a Garden omelet. Okay, I was good with that. While I waited, I listened to a crowd that was full of local hubbub. Everyone in the place seemed to live in Benton, and that was fine. Folks were happy. One of the girls came out of the kitchen and asked me that since the breakfast potatoes were done for the day if hash browns would be all right. Of course they would be. And this is what I got... an omelet filled with sauteed onions, peppers and cheese -- lot of cheddar cheese, in fact. A good, hearty three egg omelet with a fair scattering of hashbrowns and a biscuit. I also got a bowl of cream gravy on the side, homemade cream gravy with black pepper in. Now, my eggy plate was a whole lot of food, and the gravy was a massive bowl. And I had coffee. So, you'd imagine my surprise when I found my entire bill was just seven dollars and six cents. Coffee, as it turns out, comes complimentary with any bill over five dollars. While I quite enjoyed this repast, I quickly was warned by fellow diners that I had not quite come to the best of Jimmy's. So I had to come back for lunch. and underneath a stack of tomato slices, onion ringlets, pickles and a sturdy chunk of iceberg lettuce kept the meat elevated above the bottom, seedless, untoasted bun. It was served up with chips -- though you can get it with fries and a drink in a combo. I wanted dessert, too, and though I missed out on the homemade banana pudding and on the meringue and cream pies (one of which I'd glimpsed in a cooler on my previous visit), I did get a pie -- a nice, hot, powdered sugar-doused apple pie, which was warm and smooth. There's a sugar free apple fried pie as well, along with sugared versions of cherry, peach and chocolate. So, that was all pretty good, but I found I was still missing out on the real coup -- the Saturday morning buffet. Seems that between the hours of five and eleven every Saturday, there's a $6.99 all-you-can-eat breakfast buffet of epic portions, including the likes of chocolate gravy and biscuits, breakfast casseroles, biscuits, pancakes, waffles, sausage patties and links, fried eggs and scrambled eggs, fried potatoes and hash browns. It was interesting that the fellow patrons felt it important to share this with me. See, now I know that it's not all good. Jimmy's Diner may be, but it's not all good that I haven't been for breakfast buffet. And since my schedule won't let me take that in for at least a month, I've decided to not make you wait on it. Get on over to Jimmy's. So I will go back. But for now, amuse yourself with this garden omelet, bowl of gravy, burger and fried pie, and know that I will soon return to Edison Avenue. Went the other day. Breakfast was as always delicious. Just thought I'd mention they are open till 8pm on Thurs, Fri and (I think) Sat now.